Likely prepared by Harvard anatomist Samuel J. Mixter. This post first appeared on The Recipes Project on 5 June 2018. One of the first things you learn when you do reconstruction research is that the tiniest detail can make a difference. Recently, I wanted to prepare an injection wax for corrosion preparations according to a 1790 recipe. Corrosion preparations are anatomical preparations created by injecting an organ with a fluid coloured wax that hardens. 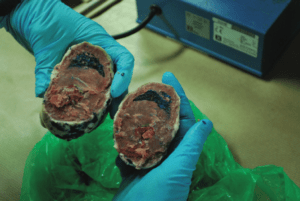 The organ is then lowered into a container with a corrosive substance, such as a hydrochloric acid solution, which corrodes the tissue, leaving a negative image of the veins and arteries of the organ. These preparations were made from at least the mid-eighteenth century, but because of their fragility, very few remain. 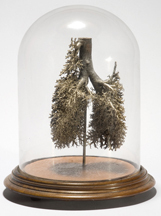 As they were supposedly difficult to make, corrosion preparations were not only a way of studying anatomy, but also a tool for self-fashioning and establishing one’s status as an anatomist. I have tried to create an injected preparation in the past.It was my first attempt at reconstruction research ever, and although it served me well at the time, now I do things differently. Most importantly, I want to stay much closer to the original recipe if possible. When we made the injected preparations in 2012, we used modern substitutes for some historical ingredients for economic reasons, and we did not have the time to study every ingredient in detail, substituting those we could not find directly with something we thought would have pretty much the same effect. The recipe I want to use, Thomas Pole’s 1790 instruction for making a corrosion preparation, calls for a coarse red wax, made from fifteen ounces of yellow bees wax, eight ounces of white resin, six ounces of turpentine varnish, and three ounces of vermillion or carmine red.The wax, resin, and pigment are fairly straightforward. What is turpentine varnish though? Back in 2012, we ended up using just turpentine rather than turpentine varnish, and although those injections were not meant to be corroded, we ran into numerous problems. For example, it turned out to be almost impossible to keep the wax and the organs at a temperature at which we could both handle it and have it fluid enough to inject. It made me wonder whether sticking with the original recipe could solve that problem, so I set out to recreate it. This turned out to be more complicated than expected, as there is not one standard recipe for turpentine varnish. Eventually I found a Dutch recipe from 1832 listing a turpentine varnish to finish display cabinets for natural history collections.The ingredients are a pound of oil of turpentine, 8 ‘loot’ (a loot being 1/32 Dutch pound) of white resin, four loot of Venice turpentine, and ½ loot of aloe or kolokwint. Raw larch turpentine has a high concentration of volatile oils that can be distilled. The fluid part is known as oil of turpentine, whereas the residue left in the retort is usually called resin, rosin, or colophony. Oil of turpentine is the essential oil that remains after distilling raw larch turpentine. Venice turpentineis a thick, viscous exudation from the Austrian larch tree, which is not used as a varnish on its own as it becomes dark and brittle when exposed to oxygen and light. Aloe vera is widely known; kolokwint (the Dutch name for Citrullus colocynthisor bitter apple) less so. It is a plant with yellow fruits that resemble small pumpkins, which are very bitter and poisonous. That quality might explain its presence in a recipe for a varnish that is meant to ward off insects. Powdered aloe is readily available from artist’s material suppliers, so I went with that. The varnish after 10 hours in the sun. The Aloe is the clearly visible murkiness on the bottom. Photograph: author. 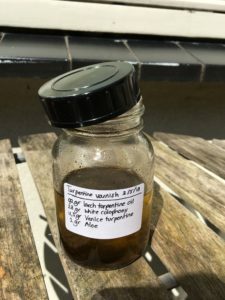 The preparation of the varnish was pretty straightforward: put all ingredients in a bottle, cover, and leave in the sun for a day. The only problem was that I had to wait a week for a sunny day. When it came, I put in the ingredients and just left the bottle out in the sun for a couple of hours, which allowed me to stir the ingredients together. The aloe however did not resolve properly, and just sits at the bottom of the jar. While this might not be much of a problem when the varnish is applied to a cabinet, it makes this particular turpentine varnish unsuitable for use in my injection wax. Next time, I will make another batch without aloe and use that instead. Why do I recount this–admittedly not very exciting–story? It shows how difficult it can be to follow a historical recipe to the letter. It also shows how much you learn from reconstruction research, even if it does not always yield the results you’d like, or as fast as you’d like. Marieke Hendriksen, Elegant Anatomy, (Leiden: Brill 2015), pp. 1-9. Thomas Pole, The Anatomical Instructor ; or an Illustration of the Modern and Most Approved Methods of Preparing and Preserving the Different Parts of the Human Body and of Quadrupeds by Injection, Corrosion, Maceration, Distention, Articulation, Modelling, &C. (London: Couchman & Fry, 1790), pp. 21-5, 122-42. S. de Grebber, Over de schadelijke huisinsekten, als de huisvliegen, wespen, muggen, weegluizen, vlooijen, luizen, motten, pels-, boek- en kruidkevers en wormen, hout-, blad- en schildluizen, plantmijten enz., met aanwijzing van voldoende en proefhoudende middelen, om dezelve geheel uit te roeijen, Volume 1,(Amsterdam, 1832), pp. 52-3. Take the hearts out of seven living Swallows and five Turtledoves, take dry Mint, Pennyroyal, Verbena, Eyebright, prepared Coriander, and Sage, a drachm each, a drachm and a half of flowers of Rosemary, two drachms each of Sweet flag and Cinnamon, one and a half drachm of Cloves, eight grains each of Musk and Gallia Muscata, five drachms each of Anacardium Honey and Styrax Calamita: make cookies out of this with Fennel-water. Every night when you go to bed, you should stick one of these cookies in your right nostril, and close it off with a ball of cotton until you have read thirty Verses from Vergil; when you have done this for some days, you should wet a cookie with Rose-water and stick it into your left nostril, and all you have read, you will remember for sure. Meanwhile, one should stay clear of the games of Venus, drunkenness, and other irregularities. After the meal one should chew on some Coriander and swallow one of the cookies, or dissolve one in Lavender-water, and cover the head with it while sleeping. 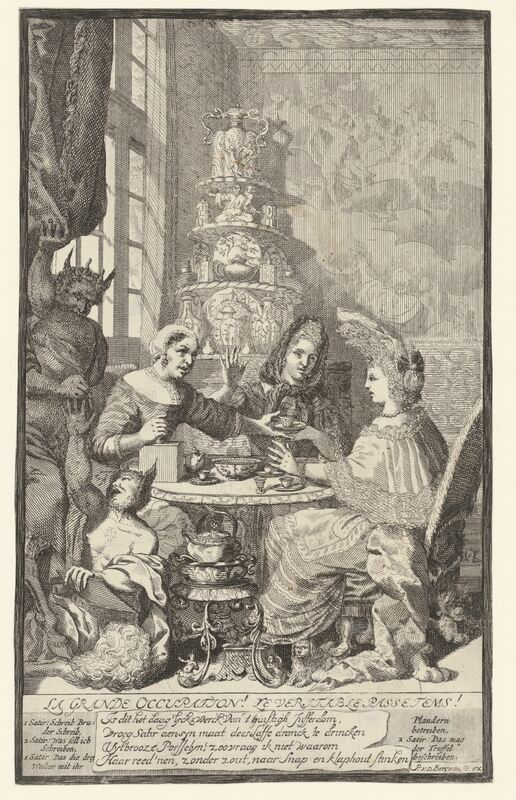 Frontispiece of the first edition of Witgeest’s ‘New Theatre of Arts’, 1659. In my search for recipes for coloured glass for the project I am currently working on, I delve into all kinds of sources: manuscripts, chemistry books, apothecary handbooks, company archives. Yet one of the most fascinating I have seen so far is a small book that first appeared in Leiden in 1659, entitled Het nieuwe Toneel der Konsten, or new theatre of arts. It is a book containing sections on magic tricks, recipes and instructions for painting, etching, and making glass, as well as home remedies and recipes for fireworks. The glass recipes in the New Theatre were of little use to me, as they were abbreviated translations from Antonio Neri’s well-known 1612 De Arte Vitraria, but the book is fascinating nonetheless, making you want to test some of the recipes yourself. Willem Goeree, by D. van der Plaets/P. van Gunst, source: dbnl.org. 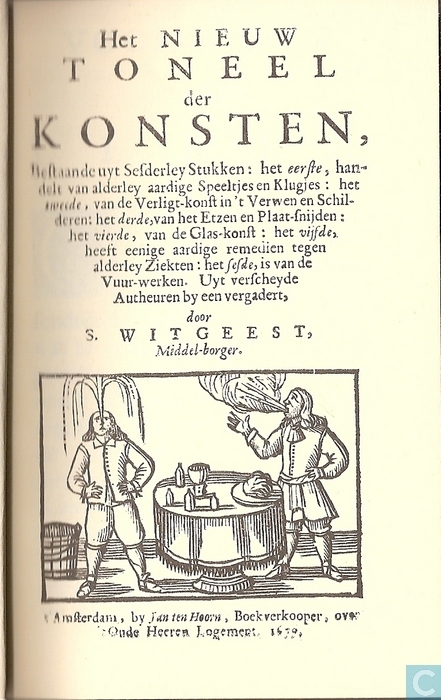 Simon Witgeest is most likely a pseudonym – Witgeest literally means ‘white spirit’ in Dutch, and it probably served to indicate to readers that the recipes were innocent, rather than black magic. 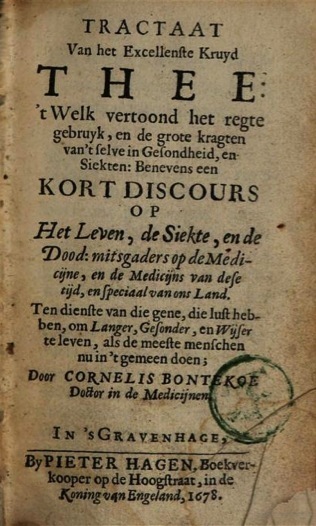 It has been argued that Witgeest was a pseudonym of Willem Goeree (1635-1711), a Dutch book trader and publisher of Dutch books on art theory and practices. However, the arguments for this are limited, and given the thorough character of Goeree’s other books, it seems unlikely that he would he would have invested time or effort in the rather frivolous Theatre of Arts, even under a pen-name. Some of the recipes, like the one quoted above to improve memory, border on the impossible and seem outright ridiculous, whereas others, such as a recipe that advises to lather winter hands with palm oil or chicken fat daily are quite common sense. Some appeal to the imagination, and one would be tempted to try them if the ingredients and the possible results were not so dangerous; take for example a recipe that advises a mixture of vinegar, egg white and quicksilver to make ones hands ‘fire proof.’ Or what to think of a recipe ‘to write in human skin, which cannot be undone:’ tattoos made with a needle and gunpowder, minium, or smalt. The author stated in the preface that the book was meant to ‘shorten wintery nights,’ although many of the activities described would only be feasible for those with a lot of time, space and money. Following the recipes copied from Neri’s book on making glass for example would require a glass oven that can be fired up to 1200 degrees Celsius. This was probably why in the many subsequent editions that appeared in Dutch and German throughout the seventeenth and eighteenth century, the title was changed to The improved and extended natural magic book, or the new theatre of arts, and the sections on glass, drawing and etching were ditched in favour of more magic tricks, practical jokes, riddles, and entertainment with mathematical and astronomical brainteasers, as well as small chemical and physics experiments. Although it is highly unlikely that Witgeest’s contemporaries actually tried the recipes for making coloured glass, the other recipes will certainly have shortened winter nights for many. Witgeest, Simon. Het Nieuw Toneel Der Konsten, Bestaande Uyt Sesderley Stukken : Het Eerste, Handelt van Alderley Aardige Speeltjes En Klugjes : Het Tweede, van de Verligt-Konst in ’T Verwen En Schilderen : Het Derde, van Het Etzen En Plaat-Snijden : Het Vierde, van de Glas-Konst : Het Vijfde, Heeft Eenige Aardige Remedien Tegen Alderley Ziekten : Het Zesde, Is van de Vuur-Werken. Leiden: A.W. Sijthoff, 1659, p. 252-3. Landwehr, John, ‘Simon Witgeest’s Natuurlyk Tover-boek et alia,’ in Volkskunde, 1967, vol. I, p. 70-71. Gout? Kidney stones? Have a cup of tea! Here I am, one month into a visiting fellowship at the Max Planck Institute for the History of Science in Berlin – a wonderful institution full of scholars from all around the world working on a wide variety of topics. As you can imagine, a lot of tea and coffee is consumed here to keep everyone going. With all those different backgrounds, that leads to heated discussions about where the best coffee in the neighbourhood is sold, and what the right way is to make tea. That, combined with a remark about tea not spoiling in green glass in a text I was researching, reminded me of Cornelis Bontekoe (1647 – 1685), alias the tea doctor, who was born in Alkmaar (the Netherlands) and died here in Berlin. People hate and despise the small and delicate, the skinny and emaciated Bodies, which resemble a ghost or a skeleton rather than a man. People want to be fat, big, and coarse, stout and well-build, full of power and vigor; one should be able to hold down one’s liquor, that is health! In over 300 pages, Bontekoe refutes common misunderstandings about tea, such as that it would dry out the body, weaken the stomach, stimulate the production of bile, cause shaky limbs, epilepsy, and even infertility. He argues that although drinking cold water is unhealthy, boiled water with the added benefit of the ‘herb of tea’ has a beneficent effect on the mouth, digestive system, blood, and mind, hydrating the body without intoxicating it, stimulating digestion and reducing flatulence. Tea according to Bontekoe stimulates the mind, improves ones mood, prevents kidney and bladder stones, can help cure gout and he common cold, and warms the blood, but mixed with milk and sugar tempers excessive heat in the body. My favourite argument however is that of the huge size and population of countries like China and Japan, where people drink tea all their lives. The tractate closes with a chapter on what good tea is: as fresh and white as possible, not too bitter, made with fresh, clean rain water that has not been boiled too long, and it should be drunk from earthenware or tin cups instead of copper ones. Tea should be not too strong, and no sugar should be added. Although there is no limit to the amount that can be had, yet those who want to sleep well at night should not drink it after midday. As for Boerhaave’s remark that tea spoils in clear glass but remains uncorrupted in green glass; this appears to have had something to do with the fact that “by using a great deal of salt to a small quantity of flints, the glass becomes very clear; but is weak and frail, apt to crack by fire and water, and by age grows dull; and even infects liquors put in it, and sometimes destroys them utterly.” Green glass was generally stronger than clear glass, although the green colour came from copper oxides – the one substance Bontekoe warned not to drink one’s tea from…. Bontekoe, Cornelis, Tractaat van het excellenste kruyd thee: ‘t Welk vertoond het regte gebruyk, en de grote kragten van ‘t selve in gesondheid, en siekten: benevens een kort discours op het leven, de siekte, en de dood: mitsgaders op de medicijne, en de medicijns van dese tijd, en speciaal van ons land. Ten dienste van die gene, die lust hebben, om langer, gesonder, en wijser te leven, als de meeste menschen nu in ‘t gemeen doen. (The Hague: Pieter Hagen, 1678). Boerhaave, Herman. Elementa chemiae, quae anniversario labore docuit in publicis, privatisque scholis. vol. i (Leiden: Isaak Severinus, 1732).